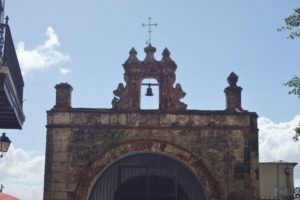 Highlight: This intimate tour was a great way to see both modern day San Juan and Old San Juan, up close and personal. Getting some time to explore Fort San Felipe del Morro, the massive fort you get to see during the sail in to Puerto Rico, was a real treat with plenty of photo opportunities. What’s Missing: It would be great if this tour was a bit longer, so we could have spent more time at some of the stops. 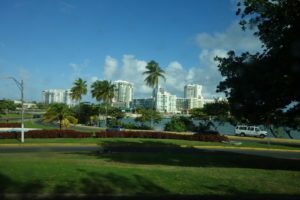 In New San Juan, there was only one stop at the beach; it would have been great to walk around some of the downtown area and see some of the amazing hotels. In Old San Juan, we felt rushed during our visit to the fort. We also opted to extend the tour ourselves, getting dropped off near the Cathedral of San Juan Bautista so we could explore more of the area and historical buildings. 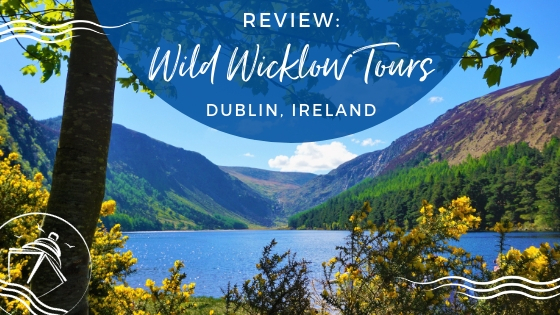 Main Takeaway: We would definitely recommend this tour and booking with Shore Excursions Group. 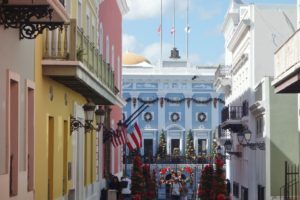 The entire experience, from reserving the excursion to meeting our tour guide and experiencing San Juan, was well organized and efficient. The tour operator was very friendly and wanted to ensure we had a great time. If you are looking to experience both sections of the city (and who wouldn’t?) then this tour is for you. With only one other couple on the tour with us, we essentially got a personal tour of the area. 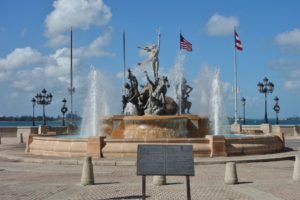 Being part of such a small group, we got to ask a variety of questions, and the very knowledgeable guide was more than happy to provide us with plenty of information about the history and culture of San Juan and Puerto Rico. With an overnight stay in Puerto Rico, we had to be up early to catch this tour which was leaving at 8am ship’s time. We had visited Puerto Rico during our Independence of the Seas cruise in 2014, at which time we did an excursion to the El Yunque National Rainforest. This time around, we were looking for something a bit more local and low-key. 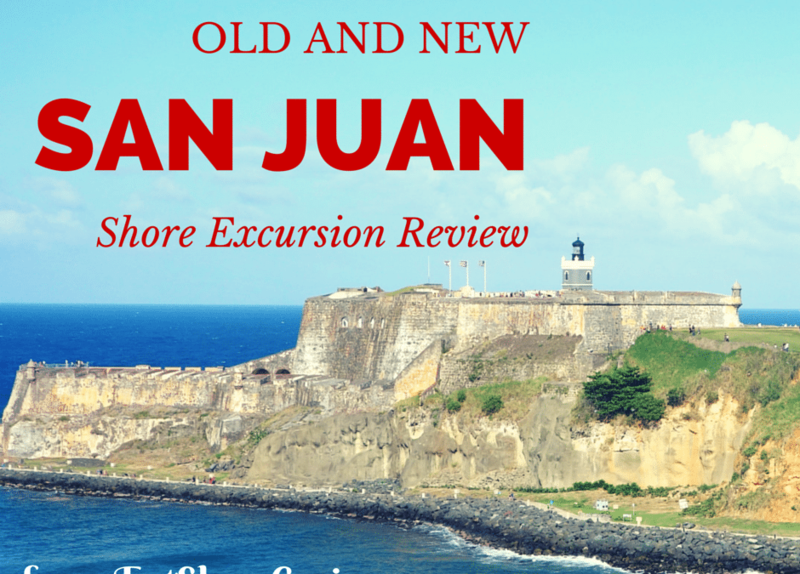 We were lucky to work with the Shore Excursions Group to book the San Juan Old and New Tour. 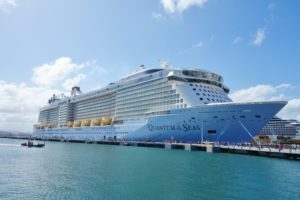 Given the great selection of excursions, low prices, and the smooth and efficient online booking system on their website, we would definitely book other excursions with them when sailing on future cruises. Up bright and early, we grabbed a quick bite to eat and were off the ship at our meeting point, in front of the Sheraton Hotel, by 7:45am. It took a few minutes, but we found our tour operator, Countryside Tours. The gentleman collected our tickets and advised us that we were waiting for one other family, from the neighboring ship Disney Fantasy. This family showed up a few minutes later, and then our tour guide/van driver, Wiley, escorted us about half a block to a small passenger van, parked right outside of Senor Frogs. 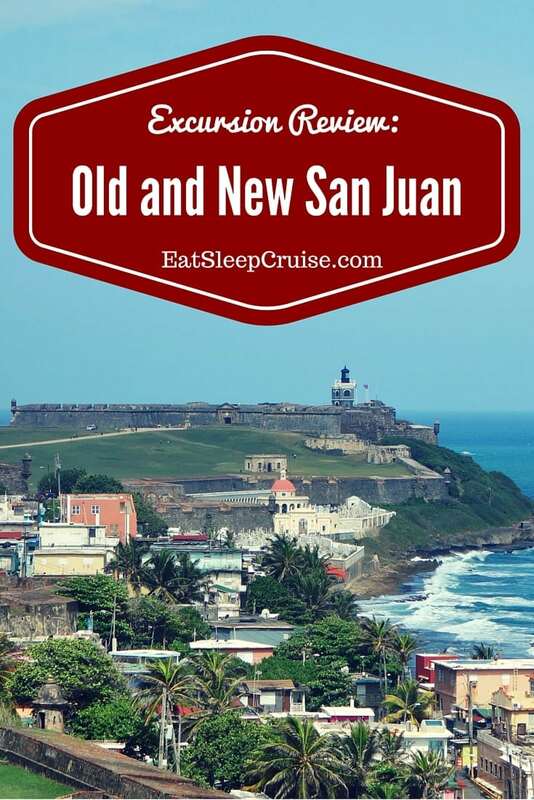 And then, the San Juan Old and New Tour was off. 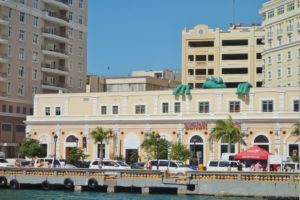 During the first portion of the tour, we would explore “New” San Juan, so we exited the inlet of San Juan and headed to the adjacent metro area and hotel district, by crossing over the Puente Esteeves bridge. Crossing over to this section of the city, Wiley began to describe the different areas of the city and how the city has expanded over the years. The major stop in this section of the tour was the Condado area, one of the main hubs of the city. Many of the city’s finer hotels and restaurants are located in Condado. Wiley suggested that if we were to come back to PR that we would want to stay on the main street Ashford. The Ashford Street area resembles Miami Beach, which is a place we have yet to visit. Hey Princess, add that to our to-do list! During our journey through this area, Wiley pointed out several of the more famous hotels including the La Concha Hotel and Casino which according to Wiley is THE hotel. We also passed by the Vanderbilt Hotel, the first hotel built in the area almost a 100 years ago by the Vanderbilt family. Newly renovated, this hotel looked beautiful from the outside and also got our guide’s seal of approval for those looking to stay in Condado. 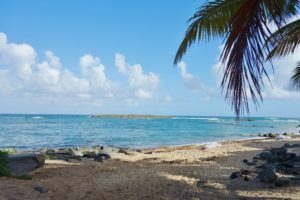 As we left the main strip, making our way back into the island, the tour drove by the Condado beach, a rather small and rocky beach. While on this small bridge, in the distance you could see San Gerónimo Fort, a smaller fort that was nearly destroyed during battles. 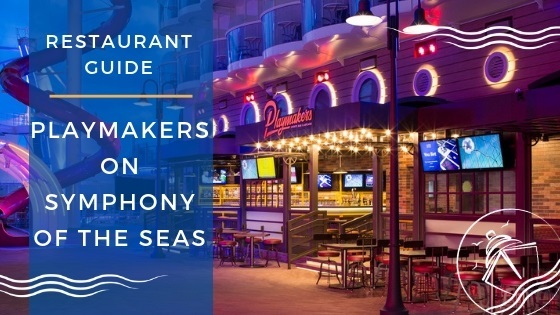 Passing to our left was the Condado Lagoon, which due to a band on motorized water craft has seen a reemergence of sea life, including a family of manatees that now call that body of water home. Travelers can still transverse the lagoon using kayaks and paddle boats- but we decided to stay in the van! Continuing through New San Juan, we passed by the Sixto Escobar park and stadium. Originally built for baseball, now the park is used for little league soccer matches. Next, we made a quick pit stop for some photos and stretching our legs at the El Escrambon Beach, the only beach on the island of San Juan. The rocky typography and island landscape meant the rest of the tour would be uphill. We spent only a few minutes here, long enough for a quick stroll down to the water and back, then the San Juan Old and New Tour continued onward! Starting our climb up the hills deeper into San Juan, Wiley gave us more on the history of Puerto Rico, from the Spanish colonization in the late 1400s to the 1950s, when Puerto Rico became a commonwealth of the United States. Our next stop was the Capitol building, or the Capitolio, where the Governor and both the House of Representatives and the Senate reside. Here, we were able to tour the inside of the building for about thirty minutes. The public is welcome to visit the building, so even though there is plenty of security, feel free to explore on your own next time you are visiting the island. 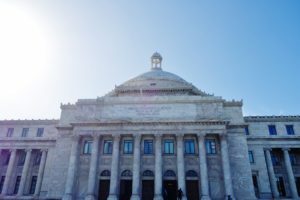 Built during the 1920s as a way to signify that Puerto Rico was part of the United States, but still maintained its own autonomy, the building itself has a distinct look. This large building is reminiscent of capitol buildings you find in the states with a dome, large columns, and plenty of marble. Yet, the design accents both inside and on the exterior most definitely have Spanish influences, making this building uniquely Puerto Rican. Climbing the stairs and entering the main floor of the building, you are able to see the Puerto Rican constitution on display. This is not a replica, but the actual original construction. 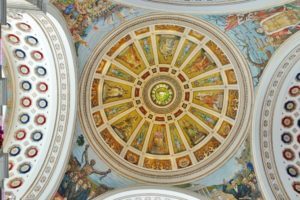 On the ceilings, you find some very detailed art work portraying some of the major milestones in the island’s history including the settling of the island by the Spanish and the abolishment of slavery. Given the time of year, there were also multiple Christmas trees on display. 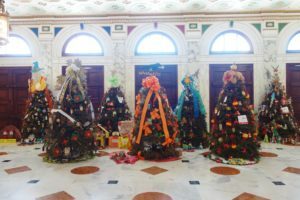 Each municipality is tasked with decorating a Christmas tree that is displayed in the Capitol building starting around Thanksgiving. Meaning, there were 6 dozen imported Christmas trees throughout the building. After our history lesson and photo ops at the Capitol building, we jumped back into the van to begin our trek into the Old San Juan portion of the tour. 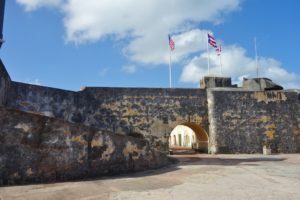 Along the way, we did a drive by of Fort San Cristóbal, the largest fort in Puerto Rico and the largest fort integrated into a city in North America. 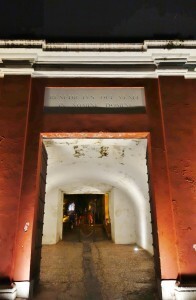 Started in 1685 by the Spanish, the fort also marks the unofficial border of Old San Juan. 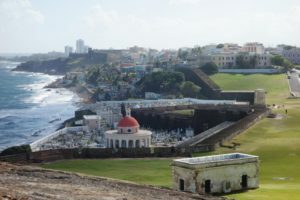 What once was a completely walled city separating Old and New San Juan, parts of the wall were removed in the late 19th century to allow for better flow of traffic. While we drove slowly by the massive fort, it would have been great to stop and get to explore this area. While driving around this area, we learned about the preservation of Old San Juan, as the historical society dictates that current day tenants maintain the look and feel of this area by restricting the colors of the buildings as well as the design and maintenance of these hundreds of year old homes and businesses. Our next stop would be Fort San Felipe del Morro, a more historically significant fort, but before we arrived, Wiley pointed out several other landmarks during our drive there, including the La Perla area, the National Historical Society, and the Museum of North Americas, which was actually once the barracks for the upcoming Fort. To our right directly preceding the Fort was the St. Mary Magdalene de Pazzi Cemetery, where famous Puerto Ricans are buried, including the national independence leader Pedro Albizu Campos. Construction began for the fort in the mid 1500s as way to defend the harbor. In fact, when you approach San Juan via cruise ship, this massive fort, with its more modern light house, is the first thing you see. Even though the fort was some four hudred years old, it was used by the U.S. as a base in World War 2. During its early life, the fort was seized by the Dutch for 3 weeks during the 1600s, but was recaptured by the Spanish. As our tour guide stated, if the Dutch would have won, this would be a very different San Juan tour! 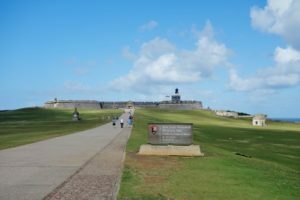 While Fort San Felipe del Morro had plenty of action from early invaders, as well as the United States during the Spanish-American war, it was officially retired in the 1960s and is now a national museum as well as a World Heritage Site. Stopping here for thirty minutes, which was not enough time to see the fort, we began the rather long walk from the street into the fort. This tour did not include admission to the fort, but it could be purchased on site for $5.00 a person, which actually covered the fee to enter this fort and San Cristobal as well. There are six different levels, and we were only able to see a few of the top levels in this amount of time. 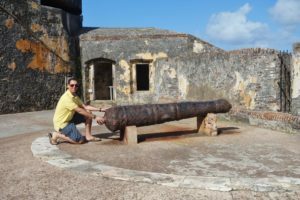 Of course, I had to take my signature picture firing a cannon into the Caribbean sea. Exploring these casemates is my idea of a historical event! We were also able to get a selfie in front of the restored lighthouse tower. The current lighthouse was constructed in 1908 as previous towers had been destroyed during armed conflicts. Unfortunately, we had to zip by the museum exhibits that were on the main level. If we had more time, I would have liked to explore the museum exhibits and the other levels of the fort including the staircases in the back that led down to the sea. Back to the bus a few minutes late, we jumped in to continue the tour of Old San Juan. Wiley described more about the founding of Puerto Rico, including the first establishment by Ponce de Leon at Caparra. Conveniently, we then drove by Casa Blanca, the house built for Ponce de Leon in San Juan. The explorer never actually lived in the home however as he died during an expedition to Florida in search of the fountain of youth. 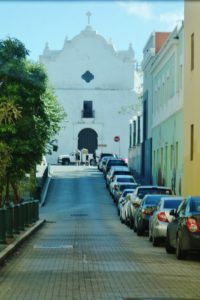 The remains of Ponce de Leon can be found back in Puerto Rico, up the street from this home, in the oldest church in San Juan, San Jose Church. Currently, this church is being renovated so the remains are on display in the San Juan Bautista Cathedral, down the road, closer to the cruise port. Before approaching the San Jose church, we made a slow pass by Quincentennial Square Plaza where a huge wooden totem pole is the center attraction commemorating Puerto Ricans’ Native American roots. Turning right onto Cristo street, we began our journey back to the ship on the cobblestone streets. Being here the night before, we would learn more about some of the sites we had seen during our own explorations in the dark. Continuing down the street we passed other landmarks, including the Govenor’s House (La Fortaleza) which was actually the first fort built to defend San Juan. The night before, we had ventured by this guarded house and took some pictures of the elaborate Christmas decorations that gilded the small street leading up to this impressive and quite massive white building. Next on the sightseeing adventure was the Chapel of Christ the Savior, a small religious center built to honor God for saving a young boy. The legend states that a young boy was miraculously saved when his run away horse drawn carriage sent him over a cliff. Thus, the town’s people built this uniquely positioned church to honor the occasion and to prevent other carriages descending the hill from the same misfortune. Rounding out our tour of Old San Juan, the tour guide brought us down toward the Puerto Rican Tourism building to show us the Racies, or Roots, Fountain. 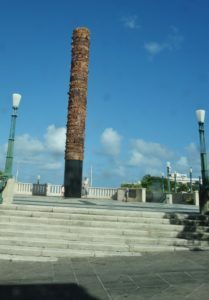 This fountain symbolizes the unique background of the people of Puerto Rico, celebrating the intertwined Spanish, Native American, and African heritage. The fountain was another sight we got to experience the night before, all lit up for the street festival. Wiley let us jump out of the van for a quick photo shoot, illegally parking on one of the side streets. While here, we also got to take a picture of the world’s skinniest building. Needless to say, after all we had eaten during the cruise, I doubt we would have fit into that building! 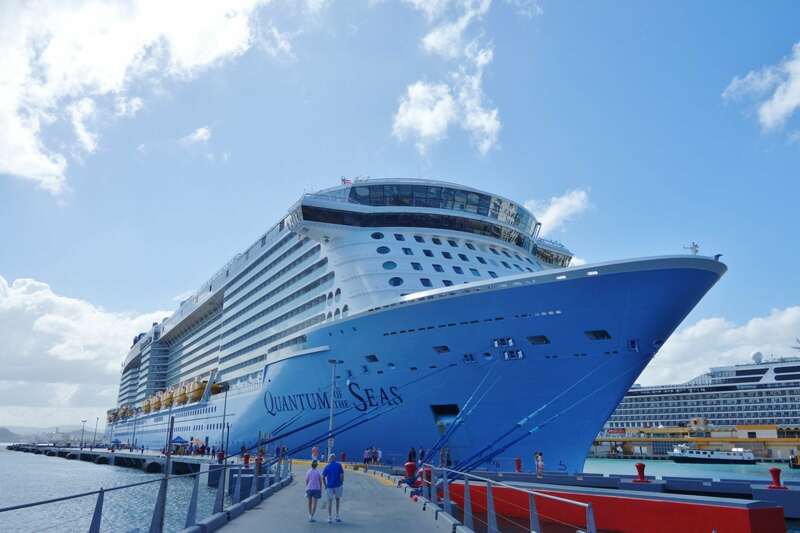 As we got closer to the ship and the end of our allotted time for the San Juan Old and New Tour, we asked if it would be possible to be dropped off closer to the center of Old San Juan, so we could continue the tour on foot and get some pictures of the San Juan Bautista Cathedral. After letting the other family on our tour off at the pier area, we were taken back up the hill and dropped off a few blocks from the Cathedral. I made sure to thank Wiley for the amazing and informative tour, and we proceeded to walk over to the Cathedral. 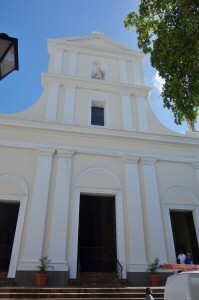 For the early settlers coming to Puerto Rico, the Cathedral was one of the first sights as they passed through the prominent red gate to enter the city. Once through the gates, these weary passengers would be met by a massive hill, which we ascended the night before. Even covered in cobblestone, it was quite a trek. They would make the climb to the Cathedral where they would thank God for surviving the long trip across the Atlantic to this New World. Our arrival to the Cathedral was much less noteworthy. Here, we took pictures of both the outside and the inside of the building, making sure to be respectful to the faithful in the church worshiping. 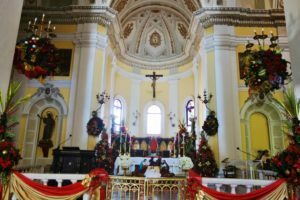 We were able to see the remains of Ponce de Leon which are temporarily being held here, some impressive Christmas decorations, and a very ornate altar and artwork. Once our self-guided tour was finished, we ventured back through the town streets and did a little souvenir shopping, finding some really nice hand made ornaments in a little arts and crafts store. 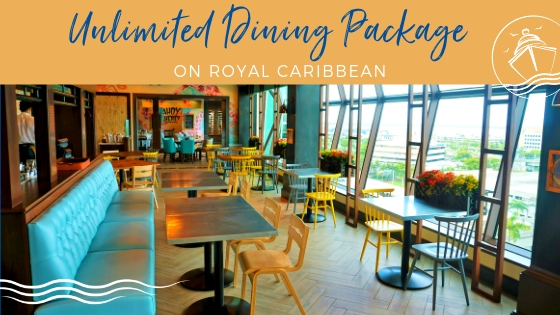 Our tour guided had made a few suggestions for restaurants to try for lunch and suggested we get Mofongo, a dish that is comprised of fried plantains stuffed with your choice of fillings. This sounded delicious, but the Princess convinced me to return to the ship, taking a few more photos in front of Quantum of the Seas before boarding. It would be the end of a great morning in Puerto Rico in which we got to learn a great deal about the history and culture. The San Juan Old and New Tour definitely inspired us to visit this island again. Until next time Puerto Rico! 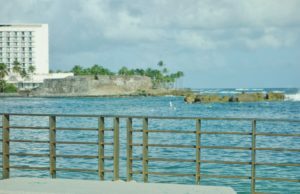 Have you toured San Juan, Puerto Rico? Do you want to share your experiences with other readers? Are there any inside tips or things cruisers must see or do when in Puerto Rico? 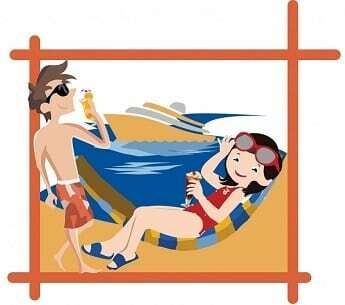 Drop us an anchor below to let us know what you love to do when cruising the Southern Caribbean! Thanks for sharing your whirlwind tour of San Juan. I was there last year on Freedom, though we didn’t take a tour but did it ‘DIY’. Ironically we did Castillo San Cristobal which is the one place you didn’t get to see, hehe. Thanks Penny for reading. We had gone to PR last year and did a walk through of El Yunque Rainforest and had a great time doing. 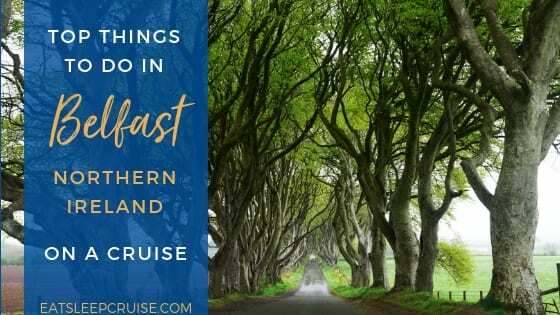 Perhaps next time you are on the island you could check that out! Old San Juan is doable on your own, but you do need either a taxi or some transport to see New San Juan. We thought the value of this excursion was great given that we traveled with just one other family and our tour guide was top notch! 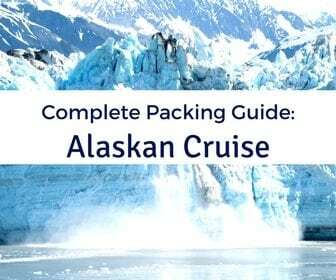 When is your next trip? San Juan looks like an amazing place to visit. I have to put it in my bucket list! Thanks for the tips! You are welcome! Definitely recommend visiting San Juan, even you do not go on a cruise, there is so much to do and see there! Thanks for reading. Wow, your tour was really comprehensive. It’s really hard to get a detailed impression when you’re under a tight schedule. Wonderful that you chose to continue on your own in order to spend more focused time. Beautiful photos, particularly of the Capitolio dome. Thanks Betsy for reading. Yes, it is always a fun to extend tours and go out on your own. We were lucky that our scheduled allowed us extra time to get some additional photos of Old San Juan. Appreciate the comment. Thanks for reading. This was our second time in San Juan, and we will be returning again this August. 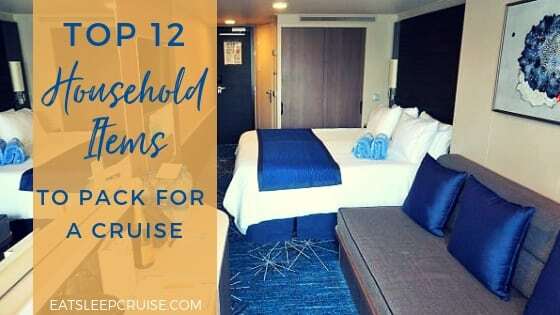 It is a great place to visit, cruise or not. Hope you get back there soon. Appreciate the comment. Never been to London, so we will be hopefully heading out there one day soon! I’ve never been to this side of the world but San Juan looks great! And you tour looked very comprehensive and complete too! 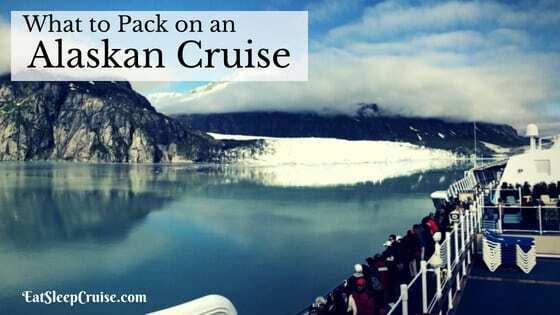 And when you’re on a cruise that’s probably not the easiest thing to do! Thanks for reading Marie-Carmen. 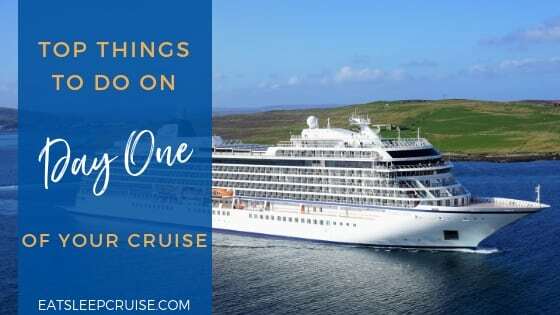 We were lucky that on this cruise we spent a full 24 hours in San Juan, so we had more time than usual to explore and do the tour. Highly recommend you visit sometime soon. 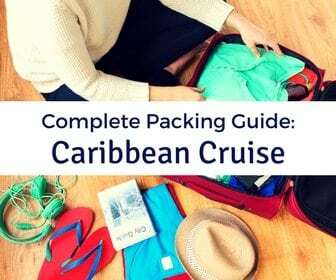 We have gone to many Caribbean islands, and Puerto Rico is one of our favorites. Appreciate the comment. Wow, PR looks amazing, and was all that just in 1 day near port? Hi Mary. Thanks for the comment. 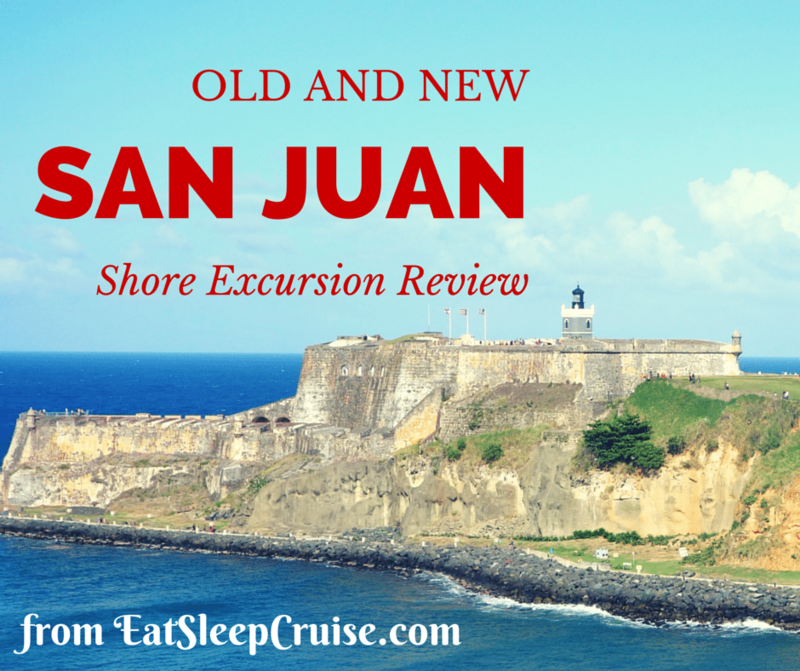 Yes, we saw both New and Old San Juan in one day at port, from about 8am to 1pm. It was a busy schedule, and there was so much we did not get to see, like the museums and other forts. That is why we are going back again this summer. 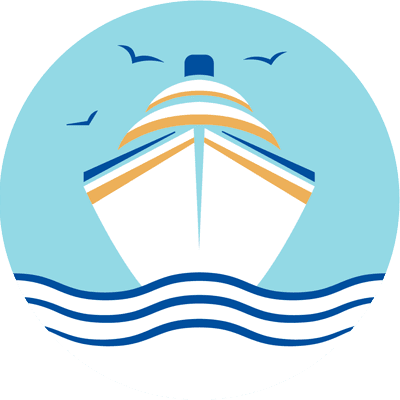 If you do visit, we found the tour through Shore Excursions Group, and we have nothing but nice things to say about the company. Thanks again for reading! Thanks Anna for reading. Have to admit, we did not use the selfie stick for the lighthouse pic, we asked someone to take our picture! LOL. 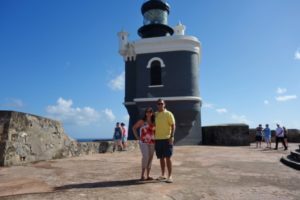 There is a lot to see and do in Puerto Rico and we tried to get as much in as possible. Appreciate the comment. That was interesting. 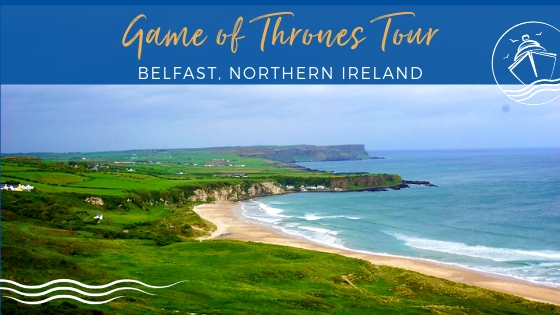 I was never one to do tours, but the more posts like this I read the more they seem like a good idea. Knowing the history of a country can lead to a greater appreciation of the places we visit! Thanks for sharing!